— UPDATED, Oct. 6 — The deeply racist character of police operations in Black communities is again on display with four more horrific murders by cops occurring within just 15 days of each other. The latest victims are Terence Crutcher in Tulsa, Okla.; Keith Lamont Scott in Charlotte, N.C.; Alfred Olango in El Cajon, Calif.; and Carnell (CJ) Snell in Los Angeles. On-going protests have erupted in each of these cities, with thousands demanding that the killer cops be prosecuted and jailed. On Sept. 21, protesters in Charlotte, shouting “Hands up! Don’t shoot!” were met by police in riot gear. The governor declared a state of emergency there, and called up the National Guard in response to widespread community outrage. On Oct. 4 a march in downtown Charlotte was organized by a coalition of groups demanding “an end to the war on Black lives and Black communities.” Actions in solidarity with Charlotte were also held elsewhere. Protests in other cities with recent victims continue as well, as many questions remain unanswered. The latest in a string of fatal police shootings occurred on Oct. 1, when 18-year-old CJ Snell was gunned down near his home after being chased by police. Associated Press says Snell’s mother, Monique Morgan, reported receiving a call informing her that her son had been shot five times in the back. Police said they had been chasing a car they were attempting to stop, thinking the car might have been stolen. When the car stopped the driver and passenger got out and ran in different directions. The cop that chased Snell killed him near his home. Police say they recovered a gun. On Sept 27, Alfred Olango, 38, a father of two and un-armed, was shot down in the parking lot of an El Cajon restaurant by police officer Richard Gonsalves less than one minute after arriving at the scene. Gonsalves and another cop were responding to a 911 call from Olango’s sister, who asked for assistance with her brother. She described Olango as mentally disturbed and unarmed, and walking aimlessly into traffic by a strip mall. It took the police about an hour to respond to this call, yet within one minute after arriving they drew their guns, four shots were fired, and Olango lay dead on the pavement. Initial indications are that community outrage has not been pacified, as the videos seem to raise new questions about the police response. The police also released photographs of a four-inch electronic cigarette device that Olango had in his hands when he was shot. Police say they mistook that for a gun. Gonsalves was disciplined last year after allegations that he sexually harassed a lesbian co-worker. He was defended by police and government officials while many in the community called for him to be fired. On the afternoon of Sept. 20, Keith Lamont Scott, 43, a father of seven, was shot and killed in the parking lot of the University City apartment complex in Charlotte, N.C. Police initially claimed that Scott posed an “imminent threat” to the safety of police officers. The police in Charlotte made no attempt to provide CPR or any other kind of medical assistance as Scott laid critically wounded in the parking lot. Protests in Charlotte have been especially intense, as the African-American community is outraged by this killing on top of other instances of police violence against Black residents of the city. In 2013, a white Charlotte police officer, Randall Kerrick, was charged with voluntary manslaughter after the murder of Jonathan Ferrell, an unarmed Black man. Last year, a judge ruled a mistrial in the case, and Kerrick walked away a free man. One Charlotte protester, Justin Carr, was fatally shot on Sept. 21 near the Omni Hotel. The police deny that they fired at him, and have arrested and charged someone else with the shooting. Within the community there is widespread suspicion that the police are covering up their responsibility for this murder, especially since eyewitnesses reported that riot police fired a barrage of rubber bullets into the crowd at the time Carr fell to the ground after being shot. On the day of the killing of Keith Lamont Scott, police had been waiting at the University City apartment complex to serve a warrant on another person, presumably a resident in the apartment complex. Scott’s family reports that he was reading a book in his parked car in the building’s parking lot while waiting for his son to arrive home from school. After the killing police were quick to develop a story that Scott had a gun in his possession, even though family and some at the scene insisted he was carrying a book when he was shot, and not a gun. According to the initial police story, Officer Brentley Vinson, a Black undercover cop, fired the shot that killed Scott after Scott opened the door of his car and got out while threatening police with a gun. Family and many who witnessed had an entirely different story. Vinson was not wearing a body cam, and was placed on administrative leave immediately following the shooting. Police finally responded to intense public pressure by releasing two short videos on Sept. 24, only a portion of the videos that they have in their possession. The released videos prove conclusively that Scott’s hands were at his side as he backed out of his car and was in no way acting in a threatening manner. The New York Times reported: “It was clear from the two angles that he had nothing in his right hand. It was unclear what, if anything, Mr. Scott, who was right-handed, had in his left hand.” The Sept. 24 video belies the original police story that Scott was threatening them as he got out the car. One question has been what exactly prompted the police at the scene to target Scott in the first place, since their stated mission was to serve a warrant to someone other than Scott. There had been no complaint to police of any illegal activity at the apartment complex. On Sept. 24 the police responded that they targeted Scott because they saw him rolling a marijuana cigarette and also saw he was in possession of handgun while sitting in his car. This led the police to assume that he was a “threat” to public safety. Earlier, Scott’s wife, Rakeyia released a short cellphone video of some of what transpired. She had come to the parking lot to give Scott a battery charger and found the police around his car. During the video, which did not capture the shooting of her husband, she repeatedly shouted, “Don’t shoot him!” “He has no weapon!” and “He didn’t do anything!” She also shouted to police that he has Traumatic Brain Injury (TBI), a result of a recent motorcycle accident. After stonewalling for about two weeks, and after widespread community outcry for public release of all videos records, the city’s police chief finally released 6 minutes and 45 seconds of additional video on Oct. 4. The police had claimed that releasing this video would “compromise” an investigation of the shooting. The new video shows Scott handcuffed and dying on the pavement while police look on. Again, this new video clip shows no evidence that Scott had a gun in his possession, or that his behavior was in any way a threat to anyone. The district attorney in Charlotte has asked for a state inquiry into Scott’s killing. In most cases of police shootings, of course, so-called “impartial” investigations by state authorities take months and years to complete. In many cases, no charges at all are brought against racist cops. In others, as took place in July in regard to the death of Freddie Gray in Baltimore, the judicial process ends up in a sequence of acquittals and dismissals of charges. In Chicago, one culmination of all the investigations into the murder of Laquan McDonald is the recent decision to hire nearly 1000 more cops! In Tulsa, on Friday, Sept. 16, four days earlier, a police video provides conclusive evidence that 40-year-old Terence Crutcher, unarmed and a threat to no one, was gunned down for no reason. The fatal shot rang out while Crutcher had his hands in the air, standing next to his SUV, which was stalled in the middle of the road. A father to four children, Crutcher was on his way home from a class at a local community college. Betty Shelby, the white cop who fired the fatal shot, was responding to a complaint of an abandoned car, and justified the killing by saying she “felt threatened” and that Crutcher had failed to respond to police commands, despite the fact that the video shows absolutely no evidence of threatening behavior. It’s hard to understand how Shelby could have felt threatened, with three additional police officers standing by her side as she shot and killed Crutcher. Initially, Shelby claimed that Crutcher was reaching inside the car for a weapon, but later video evidence confirmed that the car window was closed and splattered with Crutcher’s blood, proving that Shelby’s claim was false. Not surprisingly, as has become typical in many cases of police violence, Shelby’s body camera was turned off at the time of the shooting. Shelby, who was also carrying a stun gun, chose to use live ammunition instead. None of the police at the scene made any attempt to revive or provide medical assistance to Crutcher, as he lay dying on the ground. On Sept. 22 Shelby was charged with “felony manslaughter in the first degree” by the Tulsa County District Attorney. Adrian Colbert, a Black resident of Tulsa who lives near the scene of the shooting, told The New York Times: “He had his hands up, and they popped him. But that’s something we’re used to. It goes back to 1921. What happens here usually gets swept under the rug.” Colbert was referring to Tulsa’s 1921 racist rampage by white residents, in which roughly 300 African Americans were massacred. 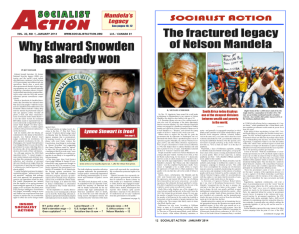 Jeff Mackler, Socialist Action candidate for U.S. president, in a recent statement condemned the so-called U.S. “justice” system as a source of the problem: “It’s outrageous! In city after city we see the same rotten features of U.S. capitalism that foster and promote entrenched institutionalized racism. “It’s a system that truly breeds racism and profits from it. It will never, of its own accord, put a stop to these horrors unless forced to through massive protest and struggle of working people and oppressed. Ultimately, this means independent political struggle directed squarely against the capitalist government, and the twin parties of capitalist rule, the Democratic and Republican parties.